Artists, makers, and craftspeople alike will be attending CRAFTED 2018! Join us for this free event renowned for its exciting collection of creatives from around the area. CRAFTED will be returning to Eagleview Town Center on June 10th from 10am to 3pm. There will be a wide array of artists, live music, demos, a children’s crafting studio, and food & more! This is a family friendly day you definitely don’t want to miss! This year CRAFTED is back with over 50 artists and each artist has unique qualities that make them stand out from each other. There are a lot of artists from different disciplines to check out and this is a great chance to meet and view work from vendors who are involved in art fields like jewelry-making, photography, ceramics, glass creation, fashion/textile making, woodwork, candle-making, and more! Check out the full list of artists coming to CRAFTED this year. To set the tone of the event, there will be a selection of local artists performing music throughout the day. The music will all be original work and will provide representation from the music sector of artistry! Along with live musical performances look forward to the demos that will be presented by our vendors! Featured demos will be from AR Workshop, Flowers by Jena Paige, and Love Street Vintage. · Anders Ruff Workshop, or AR Workshop, is a boutique DIY themed workshop. Want to learn how to “DIY” your own home furnishings or décor projects? Or maybe you want some party inspiration? ARW has instructors who teach a variety of skills – come inspired and ready to craft! Check ARW out at CRAFTED to get super creative and have a lot of fun! · Flowers by Jena Paige is a local flower shop in Downingtown, PA. FJP intends to bring a design aspect to the floral industry that’s different from the usual floral arrangement expectations. A Downingtown native, Jena Paige has always been passionate about flowers and brought that passion back to her hometown in 2016. Hear more from Jena and meet her at CRAFTED this year! · Love Street Vintage is a Downingtown classic well-known to both locals and visitors alike! Recognized for their beautiful vintage furniture pieces and homemade products, LSV wants to provide the community with pieces that make your space functional and fun! Join Love Street Vintage at CRAFTED for a fun twist on vintage furniture and design. All these wonderful demos are a way to see each artists craft in person – and in action! Plus, there will be a focused exhibit by the Lancaster Modern Quilt Guild. LMQG is “a group of quilters and artisans of varying experience who get together to share projects, talk fabric, and meet other quilters”. This exhibit will involve unique interpretations of the numerous styles of quilting. 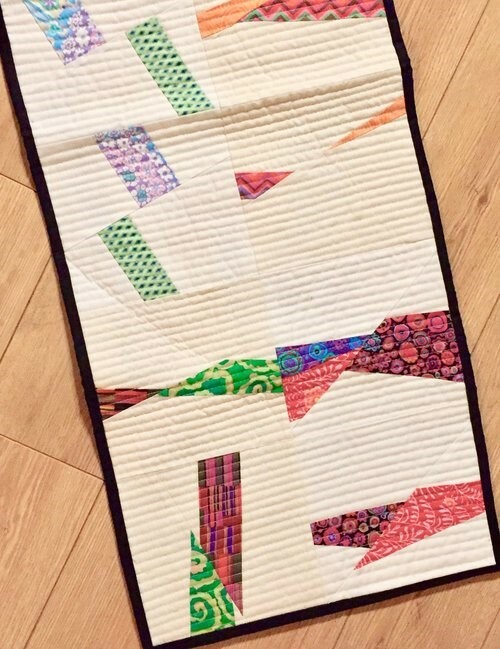 The designs will exemplify the styles of quilting members have learned from Guild’s various speakers, workshops, and sew days. Find out more on LMQG here, and check out some of their work below. Skip the babysitters - CRAFTED is a fun, kid-friendly event with activities for kids to do, too! The children’s crafting studio let’s kids get creative as well with a variety of different crafts for them to do themselves! Here are some special crafts available for kids to get involved in at CRAFTED this year: “Make and Take Terrariums” from Janet Cammarota, “Dad’s Day Masterpieces” hosted by Pinot’s Palette, and “Culinary Creations” courtesy of The Crafty Chef Academy. Plus, there will be three other activities available for the kids to get even more crafty with! Need a picture holder? Kids will have the opportunity to make a wired rock photo holder perfect for a family photo! A cute and fun washi-washer charm is great as a gift and as a decoration around the house. And, as an ode to the summer, bring the kiddos along to make sun catchers! It’ll make a wonderful addition to any window or home furnishing that gets a ton of sun. Plus, CRAFTED will be debuting their first ever Collaborative Creation for all to contribute! Have fun and get a chance to leave your mark in the Eagleview community through this fun, art-focused community collaborative. CRAFTED 2018 will be both a fun and exciting day for your family to experience on June 10th! While you’re here, it’s a great opportunity to check out the restaurants that will be at CRAFTED, too! Head over to the food tents for a little taste of everything! Grab a bite to eat from Al Pastor, known for being a modern and approachable Mexican restaurant and bar. Or maybe try something from Bluefin - a Japanese Sushi BYOB offering contemporary Japanese cuisine with innovative interpretations! Or if you’re not interested in sushi but still have a taste for seafood, Brickside Grille specializes in both seafood and steak – Brickside is known for an upscale yet casual creative American menu with ethnic additions. Last but certainly not least, Suburban provides food options for everyone! Their farm-to-table menu provides food for even the pickiest of eaters to enjoy! There is no shortage of food options at Restaurant Row in Eagleview for a day full of fun, creativity, and sun! Head over to Restaurant Row after CRAFTED for the full experience if you’re craving a bit more than what they’re providing at the food tents (and check out Bluefin’s restaurant on another day – they’re closed on Sunday’s but will be at the food tents)! CRAFTED 2018 is sure to set the tone for the event in upcoming years. CRAFTED is presented by Hankin Group and coordinated by Growing Roots.